Organizational charts serve as a blueprint for the chain of command for an organization. Different organizations tend to have more basic structures at inception, which become more complex and hierarchical as the organization expands. 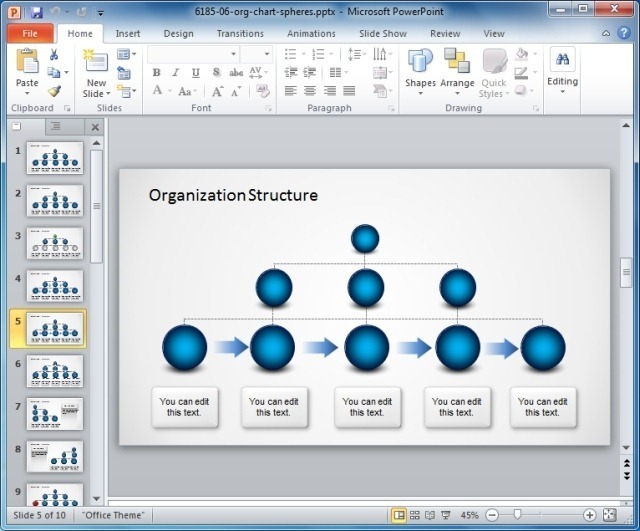 In what is to follow, we will elaborate upon the different types organizational structures, organization chart types and some recommendations for making attractive organizational charts using PowerPoint Templates. Before one can create a chart for an organization, it is necessary to classify what organizational structure is in place. Following is an overview of some commonly used organizational structures. These include Pre-Bureaucratic, Bureaucratic and Post-Bureaucratic structures. Pre-Bureaucratic Structures are common in small organizations. Such a structure includes centralized management, where the key decisions lie with the strategic leader. Unlike the Pre-Bureaucratic Structures, the Bureaucratic Structures have some level of standardization. 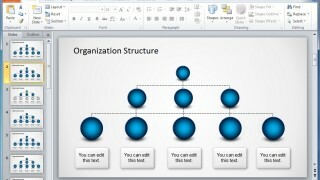 Such structures are usually used in larger organizations. Such structures have a strict hierarchy, with the flexibility of using more modern management techniques. One example is the use of Total Quality Management initiatives. 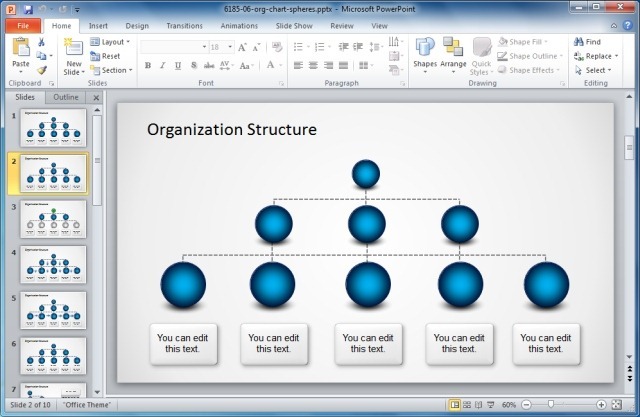 Organizational Chart Type Suitable for Bureaucratic Structures: As these three Bureaucratic Structures tend to be quite diverse in nature, you can use a multi-purpose template like the Organization Structure PowerPoint Template With Spheres for making such bureaucratic organizational charts. 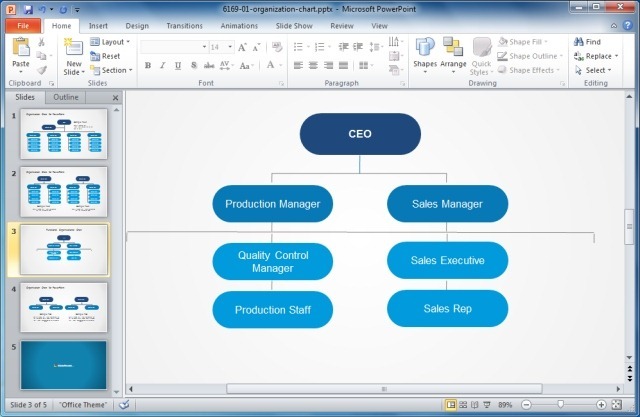 Using this template you can create a line, flat or basic org charts with simplified structures. In a Functional Organizational Structure the organization is managed according to delegation of command to different functional areas; e.g. the chain of command may include a CEO, followed by functional managers for the sales, marketing and production department, followed by their subordinates. Organizational Chart Type Suitable for Functional Structure: You can create Functional Structures using the Simple Organizational Chart Template for PowerPoint. 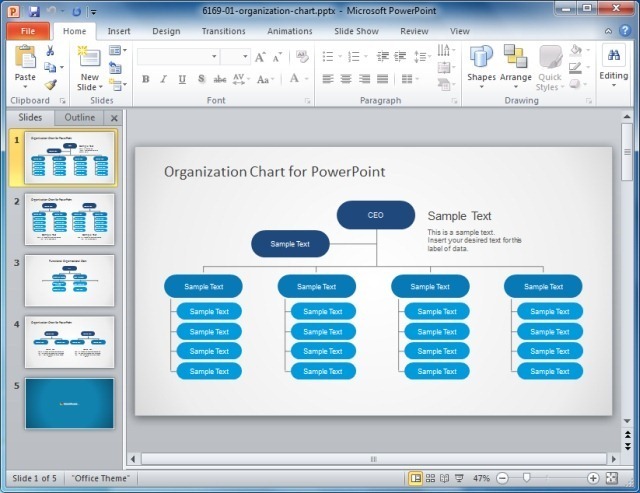 This template provides sample slides which are suitable for making functional or flat organizational charts. In such organizations, functional areas are divided in different divisions. In such a structure, each division has its own resources for independent functioning. Organizational Chart Type Suitable for Divisional Structure: Since there can be multiple layers for such organizational structures, the use of a complex template can be of immense help. 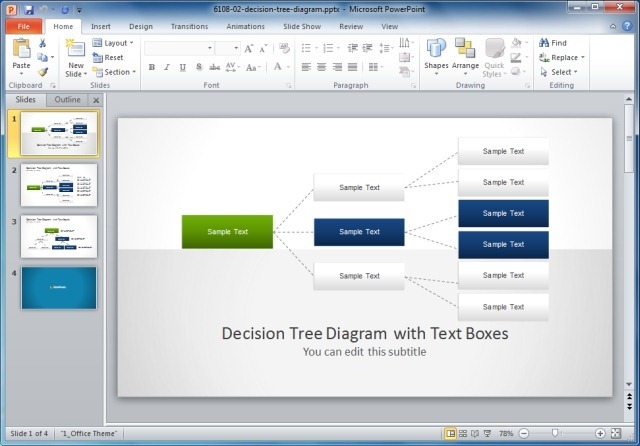 You can create charts for Divisional Structures using a lateral org chart template like the Tree Diagram PowerPoint Template or Decision Tree PowerPoint Template. This type of organizational structure allocates employees based on the product and functions. It contains aspects from both functional and divisional structures, where different teams are used for completing tasks. In such a structure a project manager may have immense or very little authority, depending upon the nature of the matrix. Organizational Chart Type Suitable for Matrix Structure: You can make use of matrix chart templates. The type of chart you create will depend upon the format of the matrix in your organization. 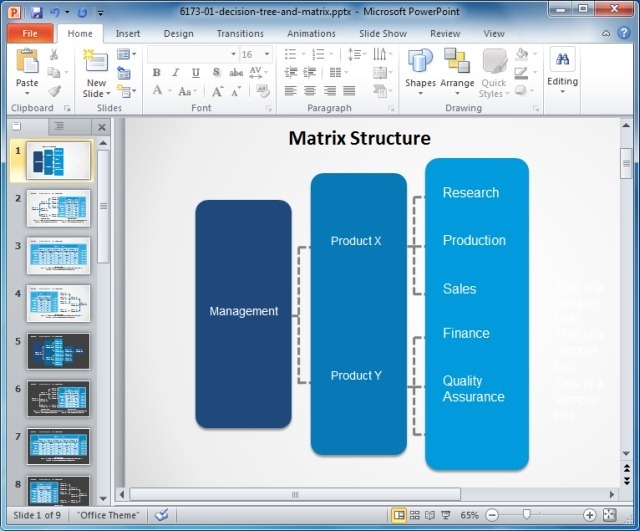 The below image shows a sample Matrix Structure Organizational Chart, made using the Decision Tree & Matrix Template for PowerPoint. 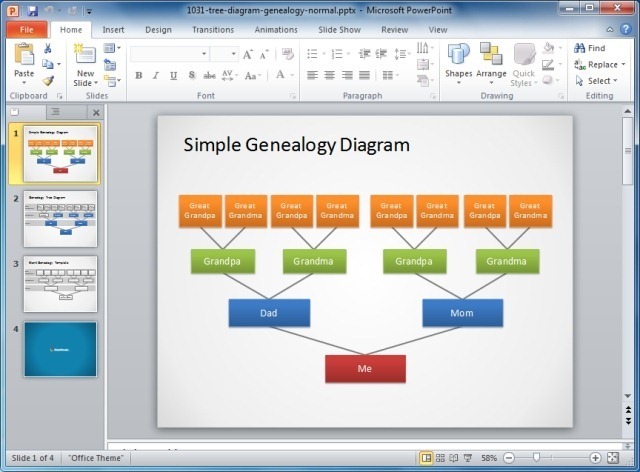 You can also use the Genealogy Tree Diagram for PowerPoint for making Matrix org charts. Other than the format of your organizational chart, you can also use various generic templates for making your org chart diagrams. These can include both conventional and unconventional chart types. For example, some unconventional chart types may include custom or photo organizational charts. 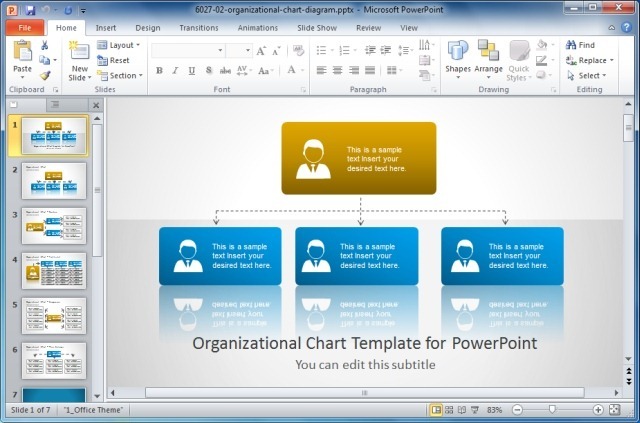 Below are some recommended templates for making different types of organizational charts in PowerPoint. Note: You can use these templates for not only making org charts for presentations but also to create diagrams for official use. 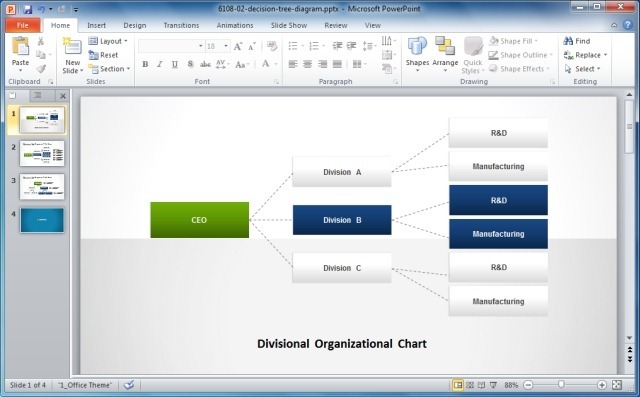 For more suggestions about making organization charts, see our post about Organizational Chart Templates For Making Attractive Presentations. 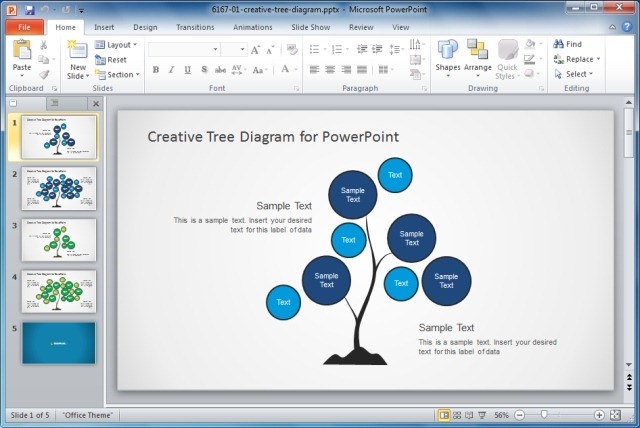 Tags: Business PowerPoint Templates, Chart Templates, Diagram Templates, Organizational Charts, Templates. The diagrams in the charts are very clear easy to understand.